Plantar fasciitis is inflammation of the plantar fascia in the sole of the foot. The plantar fascia is thick connective tissue that makes up the bottom support of the foot. Tightness of the Achilles tendon is the most common cause of plantar fasciitis. Other causes include: narrowed shoe box, weight gain, high arch, flatfoot or increased activity. Patients complain of pain on the bottom of the foot near the heel. This pain is usually worse in the morning, because the plantar fascia tightens at night. Walking also tightens the plantar fascia, causing pain. Pain may subside throughout the day after the fascia has been stretched. Your surgeon will take a history, palpate the attachment of the plantar fascia to the calcaneus and palpate along the borders of the fascia. This will reproduce pain in a patient with plantar fasciitis. X-rays may include a bony spur at the attachment site of the plantar fascia to the calcaneus, although this bony spur is not diagnostic of plantar fasciitis. Your surgeon will prescribe anti-inflammatory medications, rest, heel cushions or orthotics. Night splints can keep the fascia stretched while a patient sleeps, preventing the pain that occurs in the morning. Physical therapy to stretch a tight Achilles tendon/Gastroc complex should be considered along with high frequency ultrasound to stimulate healing. An injection can also help reduce inflammation. Care must be taken in administering a corticosteroid injection, as it may cause atrophy of the fat pad of the foot. The fat pad protects the calcaneus from injury. Atrophy or wasting of the fat pad can lead to severe pain with walking. Most patients will improve with conservative treatment over time. 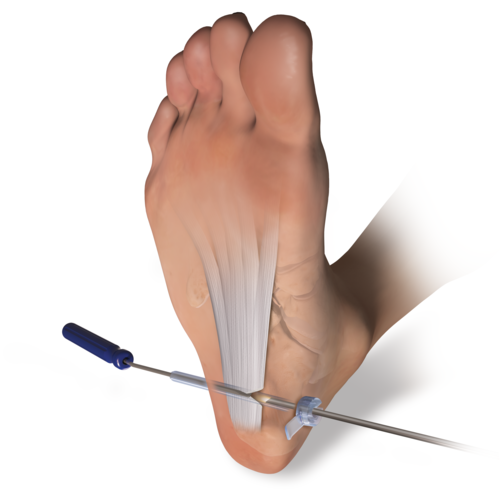 Surgical release of the plantar fascia for plantar fasciitis should be considered only after a patient has failed six months to a year of non-operative treatment.